I am beginning to let myself get excited about the new (old) house. I have been a little guarded about the process because there are so many unknown variables with a short sale, but things are looking good. 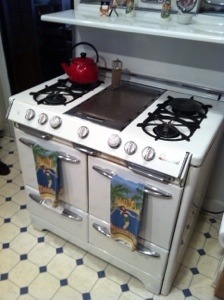 One of the exciting things about the new house is this old stove. It looks like it belongs in the house. I haven’t ever had a stove like this so I am not quite sure what we have in-store for us, but I am excited for the adventure. Plus, it looks really cool. Right? Please forgive the slightly blurry picture. Next Next post: Does this scare anyone else?